in the Grahm Warehouse 1959. Our founder, Richard Hanlon, started in the Stud Welding Business in 1958. He was a salesman with Grahm Manufacturing Company, Grahm invented the Capacitor Discharge Stud Welding process. Richard Hanlon was a salesman selling to OEM Stud Welding & Industrial Insulating Fastening interests across the Midwest. Hanlon began servicing several markets including: OEM Stud Welding, Industrial Insulation Fastening, and HVAC Sheet Metal. 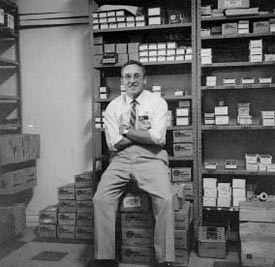 Over the years, Hanlon Equipment evolved from a manufacturers representative into a full service distributor. Products were stocked in Chicago and Hanlon set up a stud welding service center. We sell, repair & rent stud welding/insulation fastening equipment. Hanlon Equipment is a Full-Service supplier of Stud Welding & Insulation Fastening equipment & fasteners. We operate out of a modern industrial building in Elk Grove Village, Illinois. For over 50 years, Hanlon has been renting Stud Welding Equipment to all types of Industry and Contractors.